What is it?! This board is a hardware implementation (FPGA) of the entire C64, and it includes the Ultimate-II+ as well. An ALL IN ONE solution! Just because the Commodore 64 is AWESOME! What does the introduction of the Ultimate 64 mean for the established Ultimate-II+ product? Not much. The Ultimate-II+ will be continued, alongside of the Ultimate 64. How compatible is the Ultimate 64 actually? At this point it is "pretty good". Just like with the Ultimate-II+, software updates are used to fix issues. "Pretty good", sounds like it's not 100%? Why sell a product that is not 100%? 100% is an awful number. To reach this, more feedback from the community is needed, especially from other C64 experts that can help pinpoint the issues. Without exposure in the field, it is virtually impossible to make it perfect, as different people look at different things. No. This product will be a bare motherboard, which you can place in an existing C64 case, OR in a newly manufactured case from Individual Computers. What power supply do I need for this board? The power supply that I'll include with the product, will be a simple 12V DC adapter. No, no, no! First of all, this is not an "emulation!" It is an implementation. The FPGA implements the logic gates that make up a C64. So no, you won't! How dare you! Besides, you won't be able to attach any peripherals to your emulator, would you? Oh okay, so I can attach any C64 peripheral? That's the idea. See the section of I/O and controls for more information. I own a 1541 Ultimate-II, or an Ultimate-II+... This new product, does that mean that no more software updates will come out for my unit? No. In fact, the Ultimate-II+ inside of the Ultimate-64 is based on the same code. Updates for the U-II+ will automatically merge into the Ultimate 64 and vice versa. Your emulated SID is "okay", but I still like the real thing. Tell me I can use real SID chips? The board supports both 6581 as well as 8580 chips. The voltage for these chips is set by jumpers, as well as the external filter components. Jumpers? Why not software controlled? There is no need for software control, because you can not switch chips on the fly under software control anyway. As the SID is analog, I am wondering: Is the output of the real SID chip available when using HDMI? The output of the SID is digitized on the board and the digital samples are merged with the video into the HDMI stream. So, yes! Nice that I can put a real SID chip in there, but do I really need to? No, you don't. The machine will run fine without. The FPGA version of the SID will then generate the audio output. So you can switch between the "real" analog and the FPGA SID. What resolution does the HDMI output use? The output resolution is 720 x 576 at 50 Hz (for the PAL), also noted as 576p50. This is a standard resolution specified in the the CEA-861 standard and should be supported by all TVs. [Some American TVs excluded.] However, to meet the exact timing of a C64, the timing parameters of this video mode are slightly modified. I have not come across screens that do not accept the generated HDMI signal. Since February 2019 there is a NTSC mode as well, which outputs 720 x 480 at 60 Hz, also noted as 480p60. What are the frame delays of the digital HDMI port? None. There is no frame buffer, so there is no need to worry. Some screens, tho, especially non-gaming screens may introduce some latency. I observed this with a 4K screen that actually resampled the output to just 30Hz. I am pretty sure TVs do not have this problem. So if there is no frame buffer, does that mean that scrollers and such are perfectly smooth? Yes! If your TV renders the image at the speed it is sent over the HDMI link, your scroller and game will be perfectly smooth. Does the Ultimate 64 support both PAL and HDMI output at the same time? Yes. PAL and HDMI are both generated at the same time. About the analog output, does it support separated Luma and Chroma, as in S-Video? Yes, it does. Both signals are available on the 8-pin DIN connector, as well as a combined composite signal. You may need a specialty cable to get the signals out, just like on an original C64. The U64 supports both PAL as well as NTSC, also in analog mode. You mentioned 480p / 576p... that seems like about twice the number of lines needed. What do you do with the other lines? Every line is drawn twice. The second line that the Ultimate64 outputs is either a dimmer version of the previous line, or a full brightness line. The dim line gives an awesome CRT effect, while the exact copy of the previous line gives a crisp solid image. But, I live in the USA.. Will this work on my set? All modern screens support 576p for PAL as well as 480p for NTSC. For timing compatibility with my tapes and such, I assume I need to have an NTSC version.. Will you make an NTSC version at all? Would the NTSC update need a hardware change? The U64 hardware supports both PAL and NTSC, so you don't need a specific hardware version. In fact, you can switch RUN TIME between the two modes, without even resetting the C64! Does the Ultimate 64 support external cartridges? Yes, the cartridge port is fully supported. You could, but you don't need to. 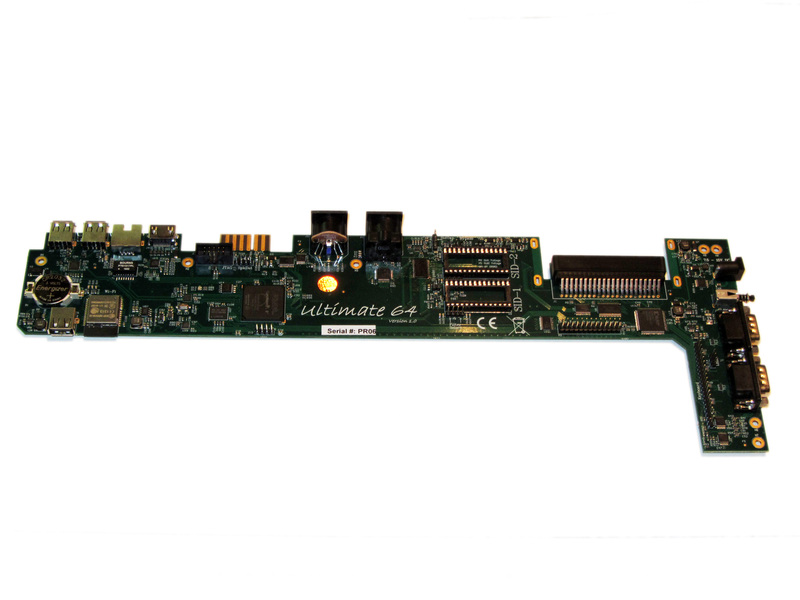 The Ultimate-II+ is fully integrated into the Ultimate-64 board. ... unless you want to use four 1541 drives? Oh, but how is this possible? You mentioned I can use external carts? You could see it as a port extender. Obviously, you cannot use the same features of the expanded port at the same time. But, you can, for example, use the REU from the build-in Ultimate-II+ function, together with an external music cartridge, or utility cartridge that allows some registers at $DF00. And of course, when you turn off all cartridge emulation features of the Ultimate-II+, the cartridge port is free to use. Is the tape port supported? How do I connect the Ultimate-II+ tape adapter then? You don't need to. The emulated tape drive automatically 'connects' to the tape pins when playing TAP files. How about the User Port? On the picture it seems that the User port is no more.. Boo hoo! You're right, the User Port is no longer avaiable at the original position. However, all signals from the User Port are available from a pin-header on the board. It is therefore possible to create an extension cable that brings out the user port. The User Port break out will be available for shipment around the end of April 2019. It can already be ordered in the webshop under 'accessories'. So, as the Ultimate-II+ is integrated, it comes with the emulated floppy drive, correct? And, I don't need to connect an external IEC cable to make use of this drive? No, that is no longer required, because it is all inside of one chip. Does the board have Ethernet? Yes, just like the Ultimate-II+, the Ultimate 64 will also have an Ethernet port. I heard something about WiFi as well? 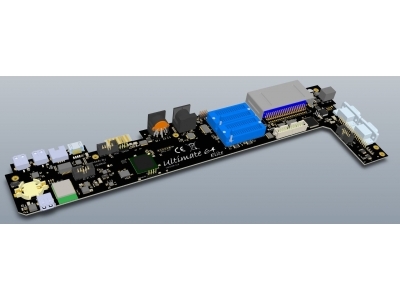 Yes, the Ultimate-64 will have a WiFi module on board. Software support for WiFi will be added after the initial hardware release. Buttons? The Ultimate-II+ had buttons, but they seem to have gotten lost.. How do I...? Relax.. There is still one button, in the place of the original power switch. This momentary switch is used to turn on the power and get into the Ultimate menu. Reset and freeze are implemented by holding the button and/or hitting the RESTORE key. You can turn off the machine from a menu option, or hold the button for 4 seconds. This the best C64 I've ever had! Compatible, comfortable and affordable - the only logic replacement for the dying C64 hardware. It's a plug and play job - plug it into your old C64 case, connect the keyboard and off we go - PLAY! Oh no, wait - there is a little configuration to do, right but only for the first time. Then you just switch it on and enjoy. The brilliant display brings memories back, the Sid emulator is good enough for me and the Ultimate software (you learned to love using the Ultimate 1541) lets you enjoy the new simplicity. So far all demos and games worked without problems. I love this outstanding hardware, thanks! When I first heard about Gideons plans, I was excited about the prospects of an FPGA solution to a replacement of the aging Commodore 64 mainboard. Fast forward to the day I received my Ultimate 64, I have to genuinely say this is THE MOST significant piece of hardware to emerge since the CMD peripherals of the 90's. The realization of Gideon's vision of an FPGA mainboard is simply stunning. From the wonderful implementation of the original ports, to dual SID's and significantly, the integration of his Ultimate II+, this is quite simply a bargain that should not be missed. To completely appreciate it you should experience it for yourself. Thank-you Gideon for bringing this work of art to the world! It's obvious, even if our old 8bits computers have a great lifetime, they will soon die, just because they are not manufactured anymore. So FPGA is obviously the only alternative to dying hardware. And this is where the Ultimate 64 is a true impressive product for getting a brand new C64 up and running. Plug the Ultimate 64 in your old c64 case and attach the original keyboard to it, and you're in. In addition to this, The ultimate 64 combines all the great features coming from the ultimate 1541. The manufacturing quality is really impressive, the support is great, and it's just so easy to use it. Thanks for this masterpiece Gideon !!! Awesome machine! The display is brilliant you want no turning back to an old c64. Also the sid over HDMI is pretty well done! Also for the audio freaks there is an header to take directly the signal from the analog sid. I want to buy a second one! 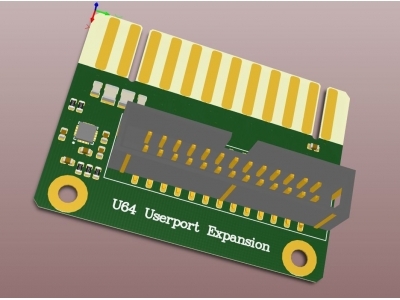 UserPort Extender for the U64 - Available from May 2019. 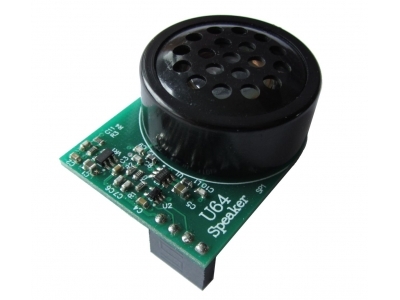 Speaker for drive sounds on U64 - Available from end of March.